Home » appalachia , moonshine , north carolina , popcorn sutton , popcorn suttons tennessee white whiskey , tennessee » Popcorn Sutton's Tennessee White Whiskey: Now in a new bottle! Popcorn Sutton's Tennessee White Whiskey: Now in a new bottle! Whenever I post anything new about the legendary moonshiner Popcorn Sutton, traffic to this blog flies off the chain. It has been a pleasure to write about him and chronicle his life and times during the past several years and Lord willing, I'll get to continue to do so for a long, long time to come. It'll always be one of my bigger regrets that I never got to meet him personally but it has been a tremendous honor to have come to know those he was closest to, including Popcorn's widow Mrs. Pam Sutton. Before his passing four years ago Popcorn was well into plans to legalize his famed likker. 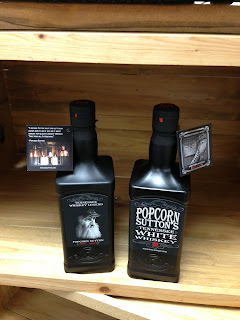 Last year Popcorn Sutton's Tennessee White Whiskey - made with Popcorn's original recipe - went on sale in Tennessee. And demand for it exploded! At one point the moonshine - originally packaged and sold in mason jars - was going for $150 and up on eBay. But Popcorn had a grander vision for his likker. He wanted to "upgrade" the container as soon as it was feasible. Some will argue that the mason jars have greater character and are more "authentic", but apparently Popcorn had problems with some people brewing 'shine on their own and selling it as his! I can understand why he wanted his whiskey to have a more distinctive and unique look. Yesterday it was announced that Popcorn Sutton's Tennessee White Whiskey is now coming out in a brand-new bottle! You can see it in the photo. It’s finally here, Popcorn's new Bottle! Popcorn always told me and others that his whiskey was “too damn good to be put in a jar,” but mason jars were all he could afford. He’d get pissed when other bootleggers would try and sell crap whiskey and pass it off as his. Popcorn said that if he had his own bottle, they would always know who's the best was. When Popcorn and I started the company, our plan was always to start in a mason jar - as it’s all we could afford - then move to the bottle his whiskey deserved. Well we did it Popcorn! Here's your bottle for the world's finest white whiskey! I hope you all love it as much as I know Popcorn does. It doesn't matter what it comes in, just as long as it's Popcorn Sutton's tried and true likker. The new packaging? It's but one more step toward Popcorn Sutton's Tennessee White Whiskey busting its way out of Tennessee and into ABC stores and grocery marts all across the fruited plain. He may no longer be with us on this Earth, but Popcorn's likker is well on its way to taking the world by storm!